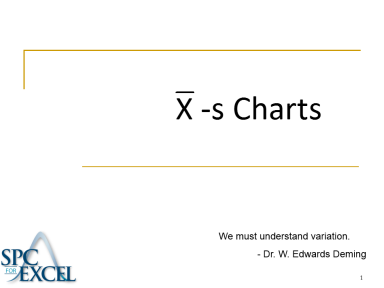 The purpose of this module is to introduce the Xbar-s chart. This type of control chart is used with variables data - data that is taken along a continuum. Time, density, weight, and length are examples of variables data. Like most other variable control charts, it is actually two charts. One chart is for the subgroup averages (Xbar). The other chart is for the subgroup standard deviations (s). The module includes explaining how the Xbar-s control chart works, how to construct the Xbar-s control chart and how to interpret the Xbar-s control chart. Examples and exercises included are bag weights, water bottle volumes, call center phone times, vaccine potency, bolt diameters, and supplier delivery performance. Exercises include questions about what the charts are telling you.